Listening to what customers want is crucial for any company to survive, but in 2008 Lego took that idea farther than most by enlisting its dedicated fanbase to actually help it design new sets. 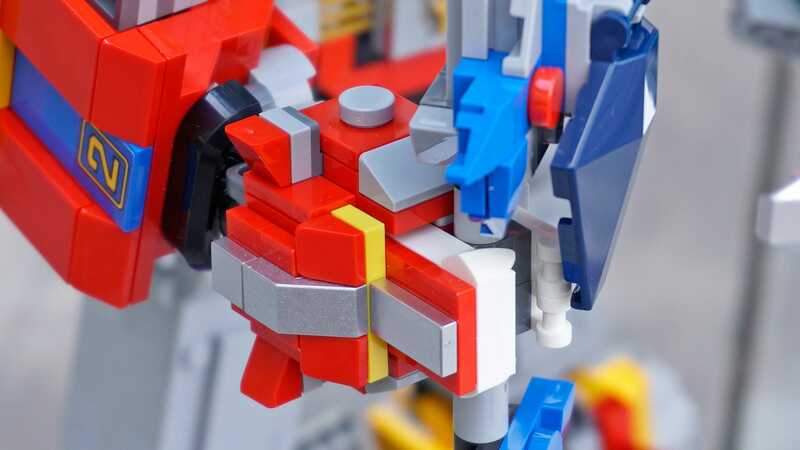 The approach has led to some of the company’s most memorable creations to date, including a towering new Voltron set that might be the ultimate mashup of childhood nostalgia. Lego is in a unique position in the toy industry; it’s not only a plaything, it’s also a medium for creators, both young and old. As many kids as you’ll find creating brightly-coloured hodge-podge spaceships, there are just as many adult Lego fans building mind-blowing custom creations like 24-foot tall working cranes, or 100,000-piece replicas of the Batcave. There are amateur Lego enthusiasts who are just as talented as the professional master builders the company employs, which is why Lego Ideas (originally known as Lego Cuusoo when it launched) is such a fantastic way to embrace the culture and raw creativity of AFOLs — aka adult fans of Lego. On the Lego Ideas site, amateur builders can submit ideas for a new set, and if they’re able to muster 10,000 supporters, Lego officially considers it for production. In its earlier days, as the company tested the waters, the original Lego Ideas sets that were approved for production (like a miniature Minecraft world, or the time-travelling DeLorean from Back to the Future) weren’t overly elaborate or detailed creations. But that didn’t stop those sets from flying off store shelves, and it didn’t take long for Lego to further embrace the platform, which later produced memorable sets like an articulated WALL•E that had Pixar fans drooling, and an imposing 39-inch tall replica of the Apollo Saturn V rocket. Aside from a 7,500-piece Millennium Falcon, Lego Ideas now represents some of the biggest risks the toy maker has taken in recent years. 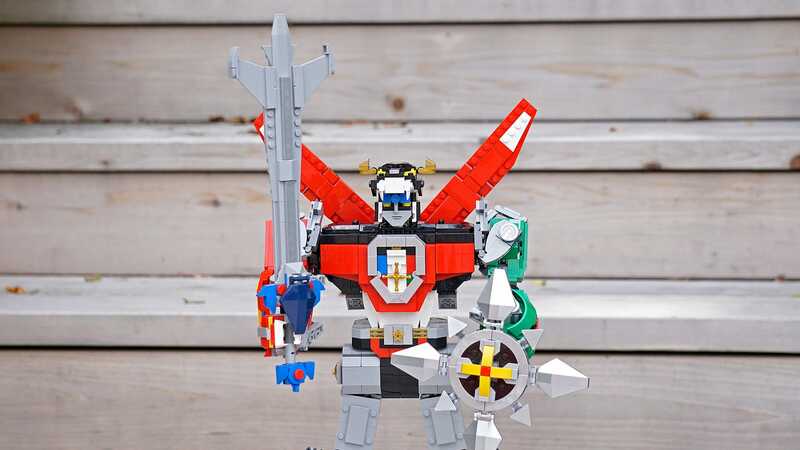 Lego’s new Voltron set, which sold out day after day at San Diego Comic-Con a few weeks ago, is proof the company has finally gained considerable confidence in the Lego Ideas platform — and that’s great for Lego fans of all ages, not just kids like myself who grew up watching Voltron. 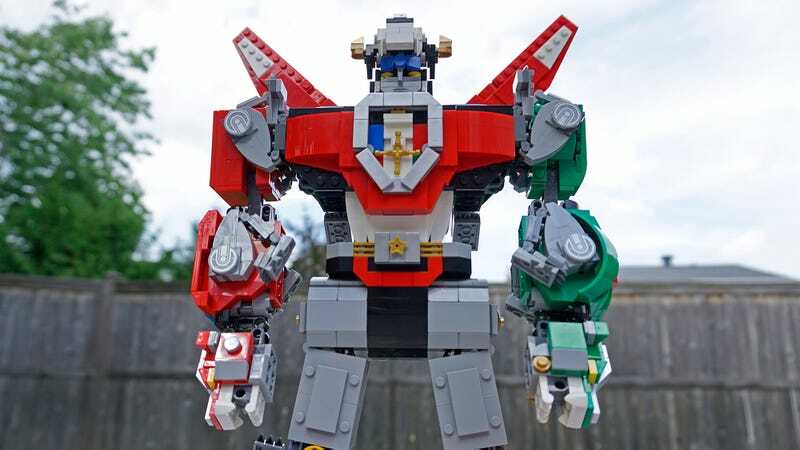 Originally created and submitted to Lego Ideas by Leandro Tayag, Lego actually made significant changes between Tayag’s original design, and the 2,321-piece, 15-inch tall Voltron model that’s now available. Every Lego Ideas submission that’s approved needs to be tweaked to meet the standards Lego has for its official production sets. Sometimes neat features or design elements are lost in that process, but in this case, Lego’s designers have radically improved the original model, making it larger, more detailed, and more sturdy for those who don’t just want to leave it sitting on a shelf. 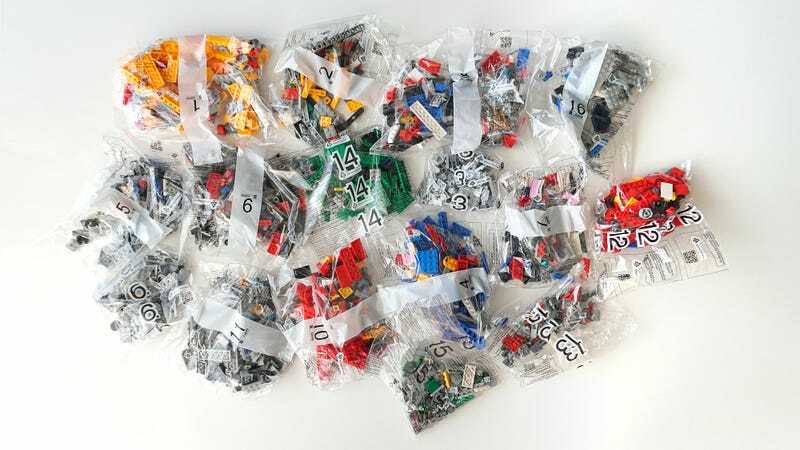 As Lego’s sets have grown in size over the years, the company has found ways to keep the builds manageable; searching for a one-stud plate in a sea of 2,321 different pieces is an act of frustration, not fun. 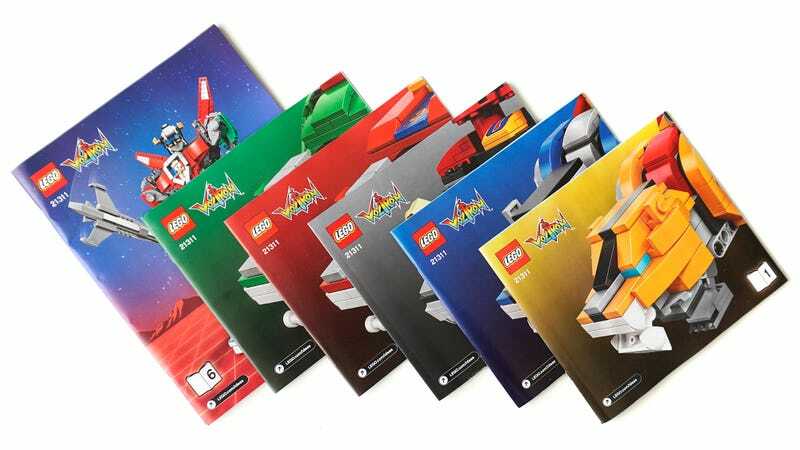 With Voltron, the pieces are organised into 16 numbered bags, which are referenced across six instruction books (one for each lion, and one for the sword and shield) that let you know which part bags you’ll specifically need. This not only provides the opportunity to stretch and savour the build over multiple days, it also makes it easier to build this particular set with others. I wasn’t quite so gregarious or patient, though, and managed to plough through the entire build in a determined six hours. Voltron definitely isn’t Lego’s most complicated build — that award still goes to the Bucket Wheel Excavator that shredded my fingers a couple of years ago, but it’s definitely one of the more detailed sets in the line. As you build, you’ll want to pay close attention to every piece you’ll need for each step along the way, as the smallest forgotten part could end up being something glaringly missing once the build is complete. 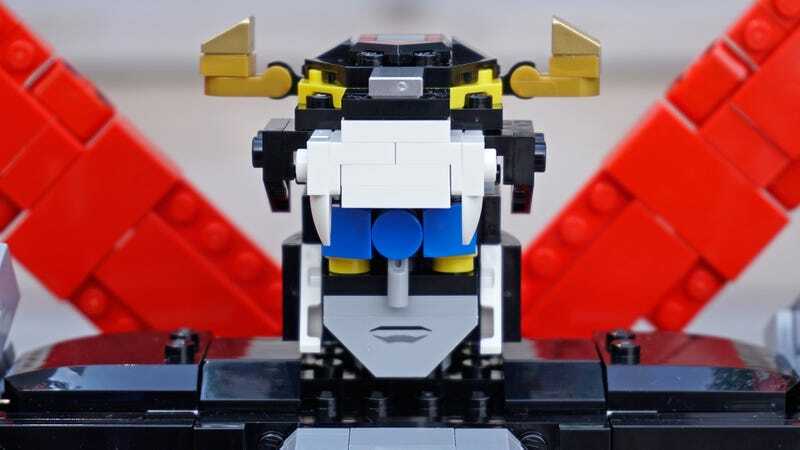 For example, there are a lot of single stud pieces that go into building Voltron’s transforming head, creating details for the robot’s eyes and nose, and fangs for the black lion’s head. In one of the instruction books, Lego’s designers elaborate on how they tested various scales for the model, but settled on this larger design as it allowed them to include even more detail than Tayag’s original model. 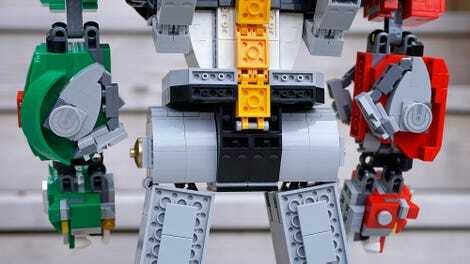 A simple gearing system helps ensure that Voltron’s arms hold their positions or poses. The most complicated part of the build involves a couple of sections that use Lego Technic pieces. 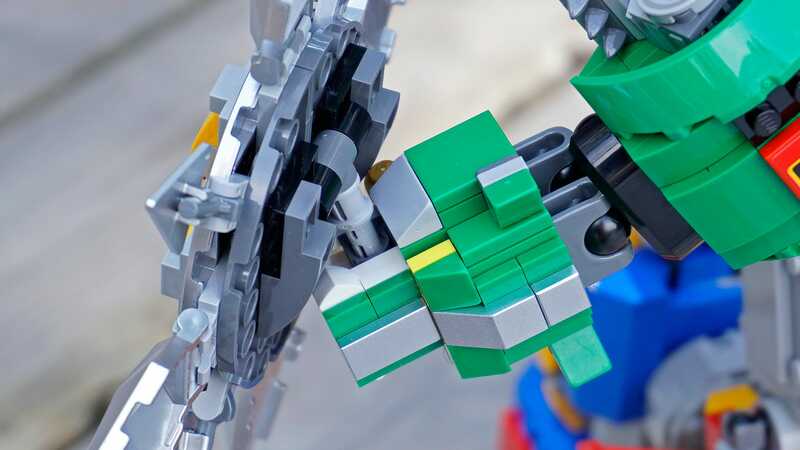 These include a clever gearing system on each shoulder connector that adds friction, so that when the heavy red and green lions are attached as arms, they can maintain their positions when raised and posed — an example of the improvements made by Lego’s official designers. 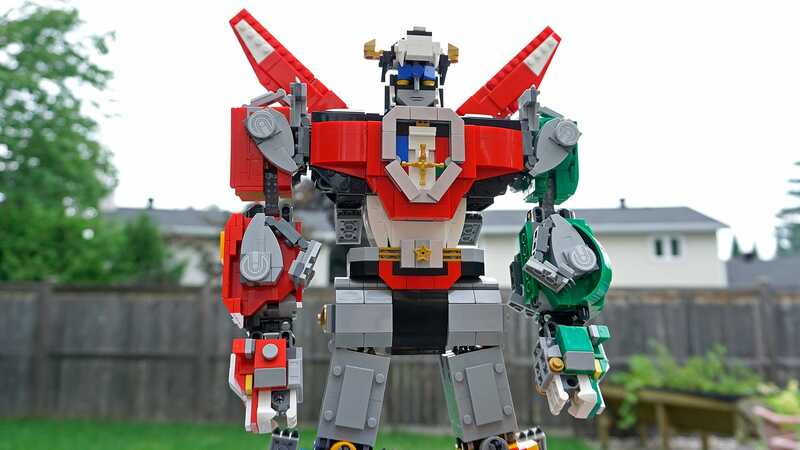 Voltron: Defender of the universe, destroyer of budgets. 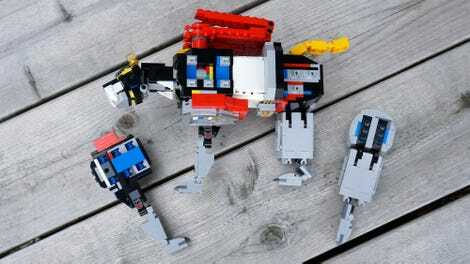 Nostalgia isn’t the only weapon Lego Voltron includes. 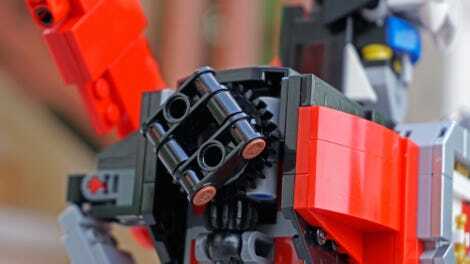 A clever use of Technic pieces allows Voltron’s lion head hands to securely hold both weapons. When assembled into robot mode, Voltron feels massive, hefty, and solid, even in my adult hands, and it brings back fond memories of the die-cast Voltron toy I lusted after as a kid. And although it’s packed with lots of tiny details, the set doesn’t feel frail or ready to fall apart. 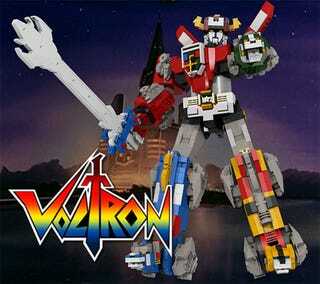 If your kids come asking to play with Voltron, you don’t have to worry about it being returned in pieces. 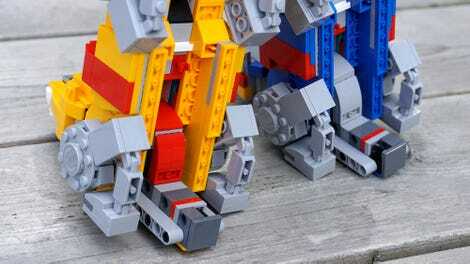 Voltron’s legs don’t bend or move, limiting poseability, but improving its stability when standing on two feet (or lion heads). However, the robot’s articulation, or lack of it, is a little disappointing. Voltron’s head can turn, and its arms can be raised at the shoulder, and slightly bent at the elbows and wrists, but that’s about it. Its legs are locked in place, and slightly splayed, which was clearly a design decision on Lego’s part to improve the model’s stability when standing. But the limited range of motions below the waist makes posing the toy a challenge. 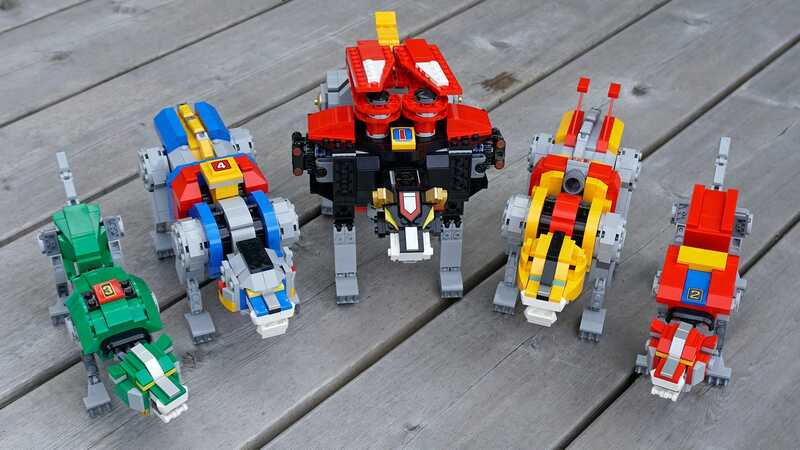 The five robot lions manage to outshine the fully-assembled Voltron. 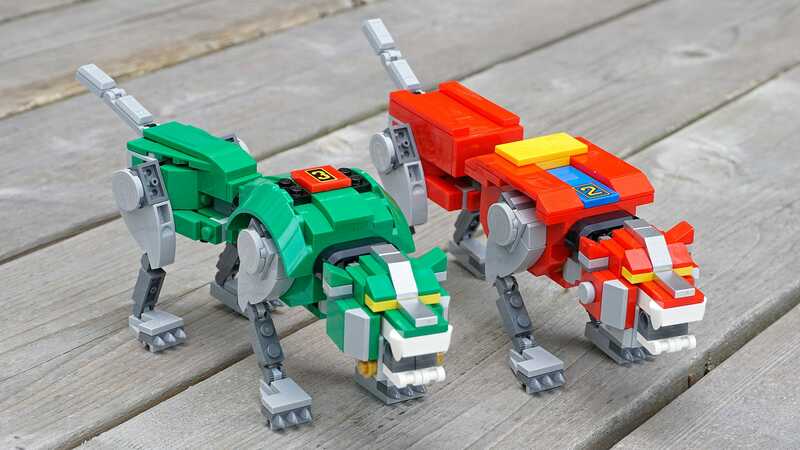 The red and green lions are the quickest and most satisfying builds in the set. Articulation is limited on the blue and yellow lions, to accommodate their ability to transform into Voltron’s legs. 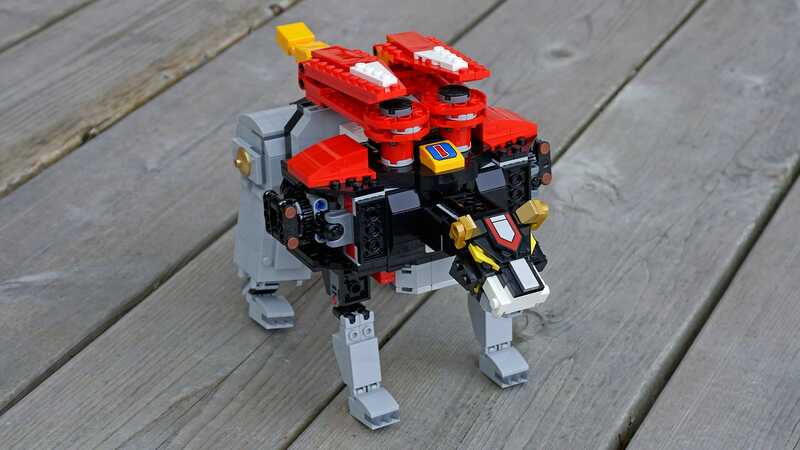 The torso-forming black lion has always been the oversized ugly duckling of the Voltron team, and that’s no different in the Lego version. Far more satisfying is the articulation and poseability of the individual Voltron lions. The ratcheted connectors used for their legs lend themselves to an impressive range of motions that hold their positions. When it comes to displaying the model, I’m actually going to be more inclined to line up the individual lions on a shelf, rather than Voltron’s full mech form. When going from lion to robot mode, Voltron is more re-assembled than transformed. Wow, Voltron, it looks like someone’s been taking the stairs at work. The flip side to Lego’s lavish attention to detail on this set is that it will set you back £160. That’s nowhere near as expensive as Lego’s £650 UCS Millennium Falcon, but it puts Voltron well out of impulse purchase range — at least for some. 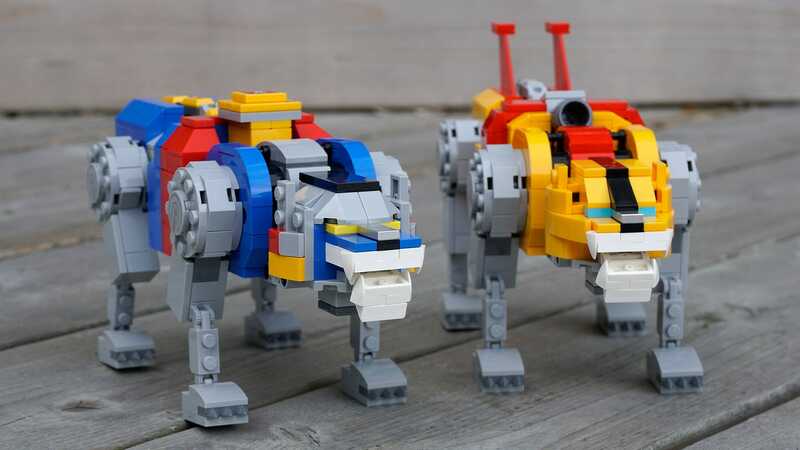 The reality is that Lego knows there’s an entire generation that grew up on robotic lions and colourful plastic bricks, and nothing loosens up purse strings like nostalgia. This isn’t a set someone is going to randomly grab off a toy store shelf, it’s targeted squarely at collectors, and Lego’s designers have ensured they will not be disappointed.